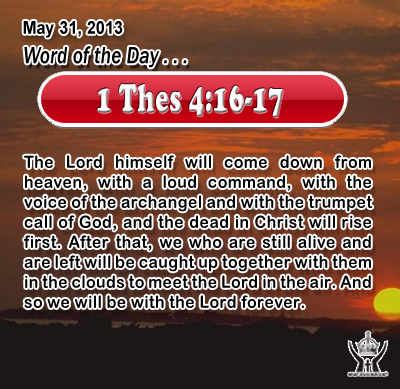 1 Thessalonians 4:16-17The Lord himself will come down from heaven, with a loud command, with the voice of the archangel and with the trumpet call of God, and the dead in Christ will rise first. After that, we who are still alive and are left will be caught up together with them in the clouds to meet the Lord in the air. And so we will be with the Lord forever. Heavenly Father, we look ahead to the day of your next great surprise. We join the angels in standing on creep as we look to the clouds to see our Lord and your Son come back in glory and receive the welcome and honor he deserves. We praise you for that day now, even though we only see it by faith. Until we see you on that day, please know our heart's wish is to serve you, even when our fault gets in our way of showing it as fully as we should. We offer you our sincerest thanks and praise in Infant Jesus' name. Amen. 39In those days Mary arose and went with haste into the hill country, to a city of Judah, 40and she entered the house of Zechari'ah and greeted Elizabeth. 41And when Elizabeth heard the greeting of Mary, the babe leaped in her womb; and Elizabeth was filled with the Holy Spirit 42 and she exclaimed with a loud cry, "Blessed are you among women, and blessed is the fruit of your womb! 43 And why is this granted me, that the mother of my Lord should come to me? 44 For behold, when the voice of your greeting came to my ears, the babe in my womb leaped for joy. 45 And blessed is she who believed that there would be a fulfilment of what was spoken to her from the Lord." 46 And Mary said, "My soul magnifies the Lord, 47 and my spirit rejoices in God my Savior, 48 for he has regarded the low estate of his handmaiden. For behold, henceforth all generations will call me blessed; 49 for he who is mighty has done great things for me, and holy is his name. 50 And his mercy is on those who fear him from generation to generation. 51 He has shown strength with his arm, he has scattered the proud in the imagination of their hearts, 52 he has put down the mighty from their thrones, and exalted those of low degree; 53 he has filled the hungry with good things, and the rich he has sent empty away. 54 He has helped his servant Israel, in remembrance of his mercy, 55 as he spoke to our fathers, to Abraham and to his posterity for ever." 56 And Mary remained with her about three months, and returned to her home. When Elizabeth greeted Mother Mary and recognized the Messiah in Mary's womb they were filled with the Holy Spirit and with a joyful expectation of the fulfillment of God's promise to give a Savior. What a marvelous wonder for God to fill not only Elizabeth's heart with his Holy Spirit but the child in her womb also. John the Baptist, even before the birth of the Messiah, pointed to his coming and leapt for happiness in the womb of his mother as the Holy Spirit revealed to him the presence of the King to be born. The Holy Spirit is God's gift to us to make possible us to know and experience the indwelling presence of God and the power of his kingdom. The Holy Spirit is the way in which God reigns within each of us. Do we live in the joy and knowledge of God's indwelling existence with us through his Holy Spirit? Loving Infant Jesus, fill us with your Holy Spirit and give us joy in seeking you more closely. Increase our faith in all your promises, our hope in the joys of heaven, and our love for You as my All.